Two weeks ago, I saw “Doctor Atomic” in Los Alamos’s Fuller Lodge. It was the Metropolitan Opera’s performance, from a DVD. I am accustomed enough to attending events in Los Alamos that it took a while to hit me: “Doctor Atomic” in the same Fuller Lodge where the Manhattan Project held dinners, dances, and convocations. I even slept and ate there on an interview trip, when it still was the only lodging in town. This was my first viewing of the opera; perhaps surprising for someone whose interests include both the Manhattan Project and music. I thought, however, that it might be a screed on the evils of nuclear weapons. I was wrong. The opera grapples with the ambiguities and pressure as the Manhattan Project moved toward the Trinity test. In doing so, some of the history is distorted. There are dramatic reasons for this; real life seldom follows exactly the needs of drama. Robert Wilson and Edward Teller are shown raising questions of the morality of the plan to use the bomb on Japan. This is true to Wilson’s actions, but not so much to Teller’s. Although Teller circulated a petition written by Leo Szilard urging that the nature of the bomb be made known to Japan before it was used, he told Szilard that he was not convinced of that action. Whereas Wilson argues with Oppenheimer, however, Teller badgers him. Teller’s persistence suggests that his role is that of mythological Nemesis, the punisher of hubris. This makes dramatic sense of the history: Teller frequently went his own way during the Manhattan Project, annoying Oppenheimer, and, years after the action in the opera, would be the agent of Oppenheimer’s humiliation in the removal of his security clearance. Teller was no stranger to hubris, providing an additional irony. Kitty Oppenheimer and her maid, Pasqualita, form a feminine counterpoint to the masculine project, again a simplification of a complex person and the relationships between the local population and the project. This seemed to me to work less well than Teller as Nemesis. The set, with workers in little boxes, felt true to the project, and Oppenheimer’s desk was a copy of wooden desks that were prized by managers for their historical cachet when I arrived at Los Alamos. The background at Trinity Site included draped fabric in the shape of mountains that I expected to be withdrawn, showing – what? – at the climax, but that didn’t happen. The ending was glib, after the successful explosion a Japanese woman’s voice asking for water. A fair enough contrast, but designed to work on the audience’s emotions, not to show the effects on the protagonists. 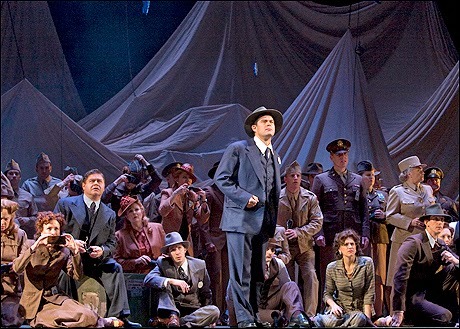 Gerald Finley has mastered many of Oppenheimer’s mannerisms and is persuasive in that role. Eric Owens is stolidly General Leslie Groves. The two figures have become almost mythological, moreso in the opera, helped by these singers. I felt that “Batter My Heart” was the real climax. It is a strange poem for a scientist of Jewish origin, almost something that could come out of one of today’s more extreme evangelical Christian churches. Perhaps it was the struggle that was meaningful to him. The reaction from Los Alamos was what I’ve learned to expect. The Historical Society made it worse by choosing a person to introduce the opera and lead a discussion afterward who knew nothing about Los Alamos history and started off with a couple of cultural bloopers. Only about thirty people attended, and several left after the first act. The opera is long, almost three hours, also contributing to a lack of interest in discussion. I’ve never seen a willingness on the part of more than a few Los Alamos residents to discuss the town’s history in depth, and many can be very defensive. I’ve always thought that voices from Los Alamos could contribute a lot to that discussion. Photo at top from Playbill Arts. The opera was premiered in San Francisco, shortly after we left the Half Moon Bay region for Vermont. Since we had season tickets to the SF Opera (nosebleed seats, but season tickets) I found that very annoying. Just-missed-it! We finally caught up with the opera in a Met in HD Simulcast, shown at Dartmouth. That was a few years ago. I agree that the Trinity poem was the emotional center of the opera. I also think that the two women in the opera were almost stick figures. I could go on and on about this, because I did some fiction writing (never published) set in Los Alamos at that time. I took pains to round out the women and their concerns. Partially because I am a feminist in my way, and partially because it was a very hard life for women in those days at that site. "Bathtub row." Your husband had to be high-ranking, or...no bathtub. As far as I can tell, Oppenheimer had a huge ego, thinking of his actions as godlike. As a matter of fact, in my own writing, I ignored him as much as possible. My protagonist was an engineer, not a physicist. My protagonist had many issues, but thinking that he was God wasn't one of his issues. Actually, I had several protagonists, but that is another story. One was a local Mormon woman. I wanted to show people who were just-people, facing huge problems and tiny ones (bathtubs). "In those days, there were gods-who-walked-the-earth"...that does not interest me as a storyteller. Though that view is definitely traditional for the German stream of opera (think The Ring versus Marriage of Figaro). Which led me to feel Teller was the most sympathetic character in this opera: placing bets, joking, being inconsistent, nagging people. His character in the opera was a real person, rather than a symbol of Man's Destructive Power, or of Native American One-Ness With Nature, or of Man's Conscience, etc etc etc. This opera is mixed bag, for sure. Your comment on Oppenheimer's Jewish background and the Trinity poem. Oppenheimer was German Jewish by background, very Reform, very Enlightenment. Teller was Hungarian Jewish, a very different background. I sometimes wonder how much this close-but-not-very-close background (both Jewish, but not the same sort of Jewish) led to some of their problems. As a woman of Ukrainian Jewish ancestry, I can contemplate this issue from a distance. I am not "in" either of their subcultures, but close enough to notice that problems could arise. Thanks for the extra background. I wish you had published your Los Alamos book! There is a book coming out called "Manhattan Project Wives," that, from the preliminary description, sounds not too good. I think it's out next month. Some things were difficult for the wives, some not. And many of the wives worked, which, in those days when the wife had to take care of the house too, added some difficulty but also brought them into the project to some degree. About Edward Teller, I have been thoroughly indoctrinated, having worked at Los Alamos for many years. Nemesis is as good as he's going to get in my mind. And that's not the worst. Last night I went to a history lecture by Los Alamos's official historian and was sort of surprised at how many Teller and Livermore jokes there were. and the audience laughed at every one. It is true, however, that in today's nuclear stockpile, the overwhelming majority of the weapons are from Los Alamos. And that might be good or bad, depending on how you look at it.